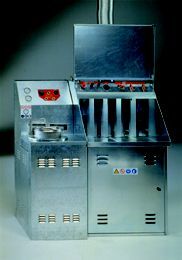 Consisting of two components, the Maratek COMBO-II units provide the benefit of recycling your solvent waste stream in an integrated tool, spray gun and parts washer. These combinations will create a COMBO 3-II or a COMBO 6-II. COMBO-II models are tailored to meet your requirements and integrate seamlesslyinto your production process. Contact us to discuss your specific needs or to obtain more details on equipment specifications.